Thirst for learning, hunger for knowledge and desire for practicality, dwell in every student. But, why only few out of many satisfy their thirst, hunger and desire? Why does not interest embrace every student equally? Find the answer in this journey of this student, a self made individual, who has explored all the ways to make a difference. Born and raised in a town of Karnataka, he has broken the boundaries and raged out as a volcano of example by exploring technology, learning and building applications, all by himself. Read on! 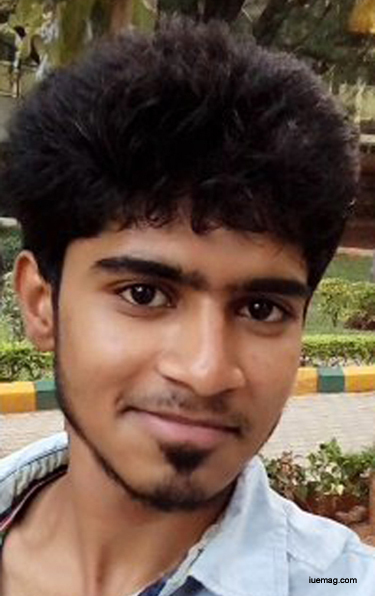 Jai Balaji, a third year computer science engineering student from R V College of Engineering, has sparkled at coding, who codes in various computer languages which include C, C++, Java and many more. Self ignited, he prefers practical analysis when compared to theoretical studies and has been instilled with abundant inspiration within himself that does not only push him out of his comfort zone, but also allows him to feel the true joy of technology. Possessing rigorous learning spirit, he turns his interest into passion. He always looks for ways which lead to opportunity and stands as the true meaning for the term, ‘self-made’ as he is the sole reason for what he is today. “Giving a start is what really brings about a change. True passion lies in those who actually takes the first step to start” says this very passionate app developer. His interest to work on technology was his inborn characteristic. “It all started in my tenth grade, when my sister taught me a palindrome program in C. It kind of fascinated me, which became a reason for me to take up engineering” he shares. Instance may be big or small, but the impact it creates would destine your life further. His curiosity to know more about technology steeply rose since then. This wonderstruck moment grew into a thunder which encouraged him to learn more, in order to turn his crazy ideas into practical solutions. It was much before his final year of Diploma, that the young doer designed his first android quiz application. “Introspecting one’s self is essential because that is when one realizes the purpose of life. The same holds true in my life as well” he mentioned when asked about the reason for his start. The dormant interest in him was activated when his passion was knocked. Eventually, his interest hiked up which marked a start to his next android app, Theft Locker- the objective is to provide an additional feature for your android device in terms of security, by providing anti-theft facilities for your smart phone. Despite, android being smart by providing smart services like GPS, Camera, Internet and more, it lacks the potential to safeguard itself when it falls into an intruder’s hand. Balaji offers a smart solution by projecting his idea onto the screens of reality. Whenever someone else tries to unlock your android device, then the owner of the device will be notified by an email alert along with which, the current location of the device can also be traced. “I execute my ideas and portray them to the world because I feel the intention of every move I make has to be justified and I also feel that education is incomplete without gaining practical knowledge to create something new” renders this champion who has prioritized studies in his life. The vibrant young man has succeeded in exhibiting his explorative nature: not hesitating to participate in technical competitions, this intellectual talent always won in most of them. He was also qualified to attend a workshop, where he learnt to build robots. This was an additional jerk to simulate his passion for pronouncing technical creations. With a vision to develop many more applications, he wants to broaden his knowledge deeper in the field of his interest. Loving what you do, greatly contributes to your success, is the fact which is clearly evident from Balaji’s story. Rather than just visualizing your idea, going all out to bring them into reality would help demonstrate your priorities in life. Come on budding professionals, throw your laziness away and bombard your activeness to prove the spirit in you. Any facts, figures or references stated here are made by the author & don't reflect the endorsement of iU at all times unless otherwise drafted by official staff at iU. This article was first published here on 6th February 2017.